Can I create and share custom Lynda.com playlists? 3. 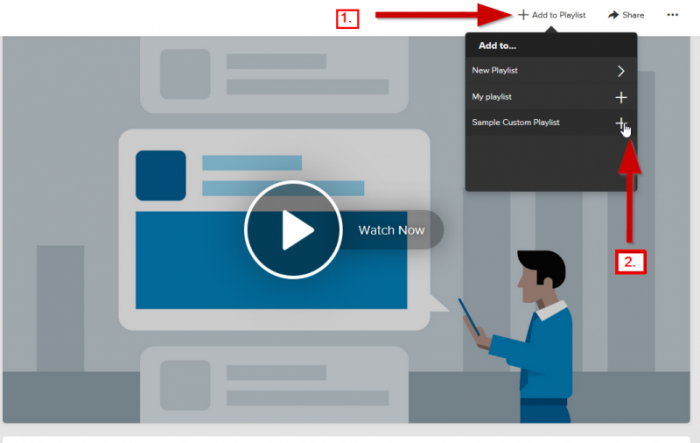 Click “See All” to manage playlists. You can also manage your playlists by hovering over your profile icon and clicking “Playlists”. 4. 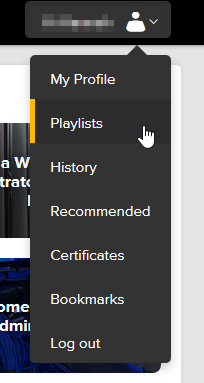 Click on “Create New Playlist”. In the popup window, name your playlist and click "Create"
5. Search for a course using the field at the top or bottom of the screen. 6. Once you’ve found a course, click to open it. 7. In the top navigation bar, click on “+ Add to Playlist”. Then, select the playlist Select playlist you created in Step 5 from dropdown menu and click the plus (+) sign. 8. 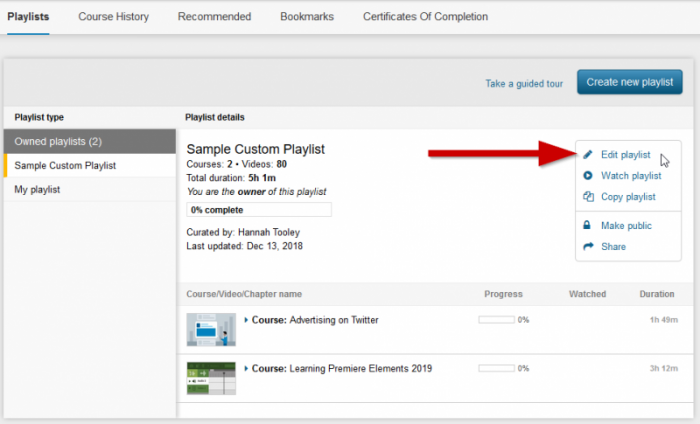 After clicking on the plus (+) symbol, it will ask you whether you want to add the current video to your playlist, or the whole course. 9. After making your selection, the plus (+) symbol will change to a check mark to show which playlist it has been added to. 10. 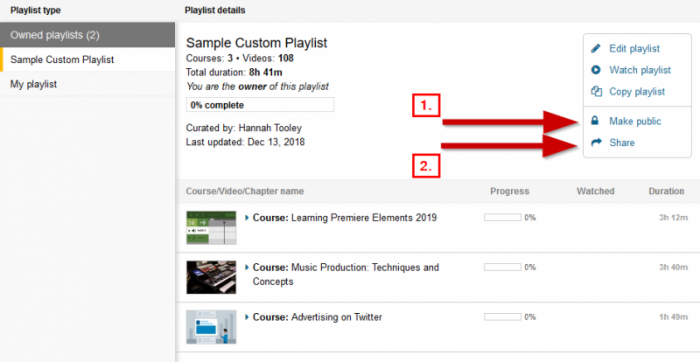 Repeat steps 6-9 for each Lynda course/video you would like in your playlist. 1. 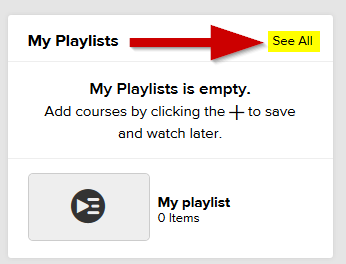 Go back to the Manage Playlists page by going back to lynda.com and clicking on “See All”. Alternatively, you can hover over your profile in the top right corner and click on “Playlists”. 2. Select the playlist you want to manage from the left sidebar. 4. 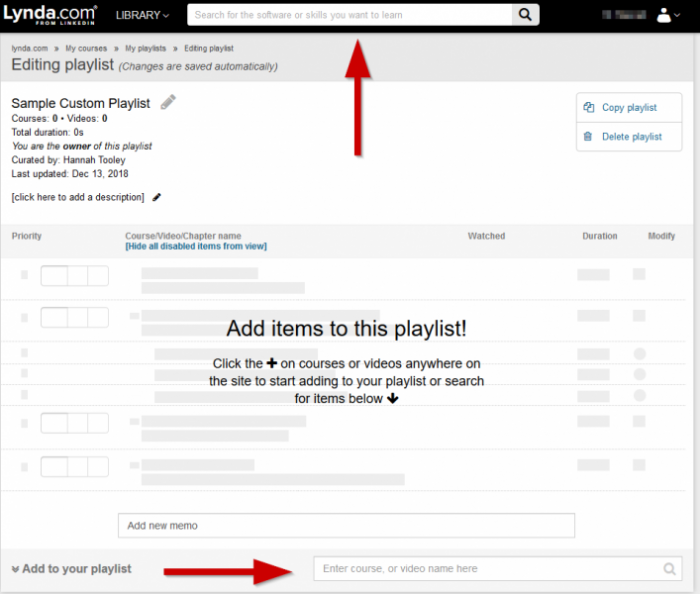 To rearrange the order of courses/videos, click and drag each item. 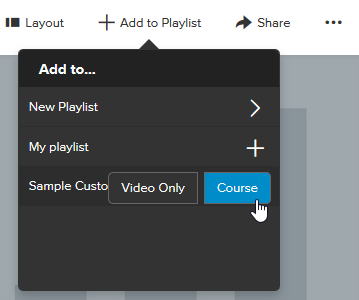 You can also click on the arrow icons or type in a number to reorder the videos/courses. To delete a video or course, click the trash can icon. 5. Click on pencil icons to change the name of a playlist or its description. 2. Select the playlist you want to share from the left sidebar. 3. Make your playlist public. You must make your playlist public in order for it to be available for sharing. To make it public, click on the “Make Public” option or the lock icon.Then, click “Share” to share your playlist. 4. 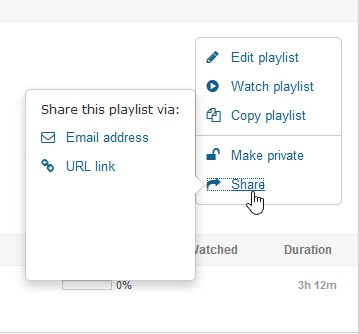 You will have the option to copy a link to the playlist, or share the playlist by sending an email. 5. 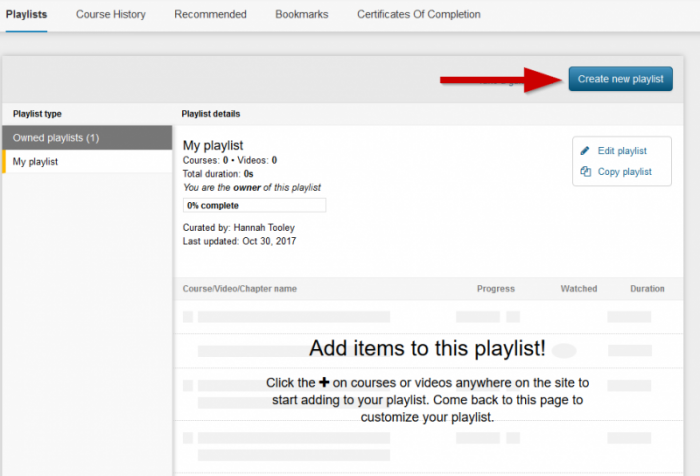 After sharing the link or sending an email, students will be able to follow your playlist from their personal lynda.com accounts.